Part of the hanami tradition includes eating cherry blossom-flavored snacks, including classics such as sakura mochi. Now the number of sakura-themed goods are blossoming as more and more major corporations jump on board with their own snacks and items. Here’s a taste of some of the items on shelves now. This season Starbucks isn’t roasting just coffee beans but cherry petals with its sakura chiffon cake. You can also wash down the sugary treat with even more sugar — either strawberry sakura lattes or strawberry sakura frappuccinos. If you want to experience spring all year round, you can also pick up Starbucks’ cherry blossom-themed mugs and tumblers. Get a move on; these sell out fast. Now that you have your sakura mug, why not fill it up with Kimura Drink’s sakura cola? This fizzy concoction contains the extract of real sakura leaves for an authentic taste of spring. Worth noting that Kimura Drink has previously launched sodas with curry, tomato and wasabi flavors so they clearly know what they’re doing. Suntory’s chu-hi drink is made with real Sato Nishiki cherries and sakura liqueur. At 4 percent alcohol, it’s about half as strong as most shochu drinks, giving it a light, sweet and fragrant taste. If sake or chu-hi is a little strong for your taste, you can always go with the more refined option of this sakura-mochi beer. This beer uses much less hops than your average beer and balances it out with flavors inspired by sakura-mochi — a traditional spring treat consisting of rice cake and bean paste wrapped in a cherry leaf. This delicious beer is produced by Sanktgallen, a microbrewery based in Kanagawa Prefecture, who insists on using only the famous Takato cherry blossoms from Nagano Prefecture in its sakura beer brewing process. In the past McDonald’s has released a sakura burger, but this year they are keeping it simple. Available now are the sakura soda, sakura float and ume fries. While the soda is just what it sounds like, the fries are more interesting. Probably inspired by its successful chocolate fries, the side comes with plum powder, which should be put on the fries and liberally shaken. 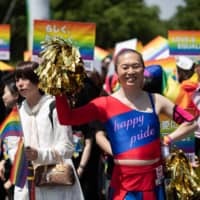 It’s well-known that Nestle saves its wacky flavors for Japan. In the past the company has created a variety of Kit Kat flavors ranging from pumpkin to, yes, cherry blossom. This year it is trying something new with pistachio and raspberry-flavored Kit Kats that come in a spring-themed box along with a sakura keychain. The company says, naturally, that the new flavor is the “perfect” hanami treat. For a more sophisticated sakura treat, Lindt is rolling out its sakura macarons. The treat is filled with a cherry puree ganache. Its special macarons are available until April 12 and the company’s Lindt Chocolate Cafes. And if that wasn’t sweet enough, Lindt also has a white chocolate cherry ice drink. Its topped with white chocolate shavings and cherry syrup. Sakura butter might sound like an odd flavor, but if you’ve ever had sakura shortbread cookies, then you’ve already experienced it. What does it taste like in the form of a chip? That’s for you to find out. Calbee has never shied away from strange flavors as it has produced shrimp, pizza and okonomiyaki chips in the past. In case you need some pep in your step at the hanami party, Red Bull has a Japan exclusive for you. Its “spring” drink, featuring a bright pink can, will keep you out of a food coma. Grab a couple of these in case your party heads off to an izakaya once the sun sets. Baskin Robbins is doing something really special this time around. After a 24-year hiatus it is finally bringing back its sakura salted ice cream. The ice cream contains real sakura leaves and a hint of sea salt to contrast the light, sweet floral taste. It’s available till the end of May, so stop by your local Baskin Robbins and scoop it up. You’re sure to be a hit at the hanami parties if you show up in Nike’s sakura shoes. The modern kicks have a traditional look with prints that somewhat resemble suibokuga (Japanese ink wash paintings). The sakura line is available as skate shoes, sneakers and even high tops. So whether you’re on a short jog or taking it to the courts, you can do it while decked out in your sakura swag. Need to have that spring feeling wherever you go? You can bring sakura experience with Itoman’s cherry blossom toilet paper. 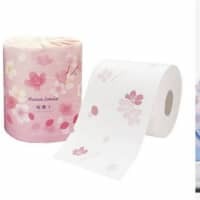 This sakura toilet paper is covered with sakura print, making your trip to the bathroom almost as great as a hanami party.